BEVERLY – There are horses for courses. And there are singers for songs. No one really knew about a woman named Linda Eder until the musical “Jekyll & Hyde” premiered on Broadway, and she blew people away in the role of Lucy Harris, buoyed by a score replete with power ballads suited to her voice and style. Broadway’s original Dr. Jekyll, Robert Cuccioli, is directing the North Shore Music Theatre’s production of “Jekyll & Hyde” and he knew right away what was Job 1: Finding Big Voices. He did, and they are a perfect match for both the show and the score, and it makes this “Jekyll & Hyde” both exciting and compelling. 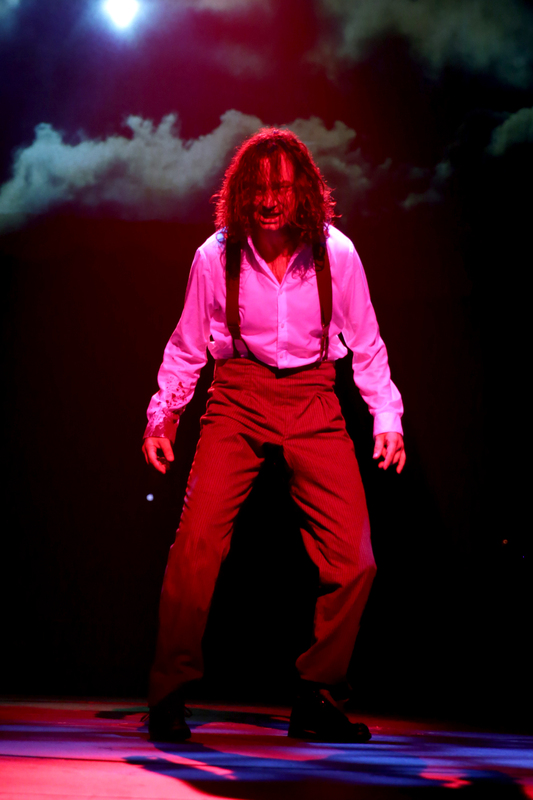 The musical adaptation of Robert Louis Stevenson’s Gothic novella is the tragic story of Dr. Henry Jekyll (Constantine Maroulis), whose devastation at the mental illness of his once-brilliant father in late 19th Century London compels him to find a way to separate the good and evil in a person, and then eliminate the evil. He believes he has found a way, and has the support of Sir Danvers Carew (Jim Brochu) in getting his experiments approved by the other governors of St. Jude’s Hospital. He is shot down. And with no chance of obtaining a human guinea pig, he makes himself the subject of his own experiment, which goes dramatically awry when he morphs into two separate identities – his own and Edward Hyde, who terrorizes London by night. Jekyll nay hold a grudge, but the grudges held b Hyde are both murderous and deadly. One by one, he eliminates the members of the Board of Governors who stood in Jekyll’s way, such as the imperious Simon Stride (Raymond Jaramillo McLeod,) the unctuous Bishop of Basingstoke (William Mulligan), Lady Beaconsfield (Alison England) and Lord Savage (Michael Padgett), who look down their noses at the less fortunate. Through it all, his faithful friend and lawyer Gabriel John Utterson (Tom Galantich) stands squarely by his side. Maroulis, who played Jekyll both on Broadway and on tour and was in last season’s acclaimed NSMT production of “Evita, is alone probably worth the price of admission. Playing Jekyll again is like putting on a a pair of comfortable slippers for Maroulis. He sings with skill and passion, but he also masters the necessary emotions to portray a character almost literally split in half, culminating in the difficult number “Confrontation” in which the two sides of his personality battle for control. When Maroulis is in full throttle in numbers such as “This the Moment,” you can hear him up and down Cape Ann and it sends a chill up your spine. 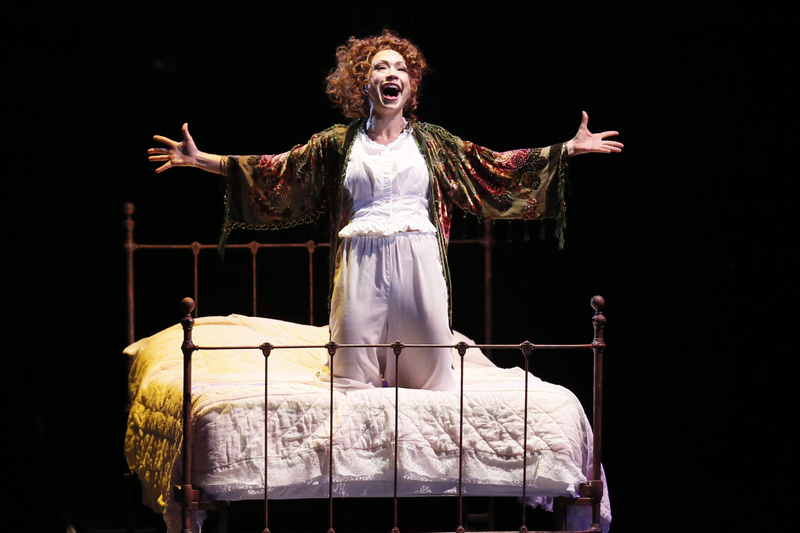 And in the same mold, Diana DeGarmo, like Maroulis a veteran of “American Idol” and also a veteran of the national tour of “Jekyll,” who reprises her role as Lucy Harris, the prostitute befriended by Jekyll who finds herself entrapped between Jekyll and Hyde. To be perfectly honest. There are times when the score by Leslie Bricusse and Frank Wildhorn is simply overwrought, but in the hands of Maroulis, DeGarmo and Primack, all is well. This is hardly a dance show but choreographer Kelli Barclay does a fine adapting the choreography for the in-the-round configuration and staging numbers such as Act II’s “Murder,” when Hyde’s rein of terror becomes the talk of the tabloids and the citizens of London. The production values are top-notch in helping to create the Victorian-era Gothic gloom and doom of the era, when London could be a dark, dangerous, often dreadful place. 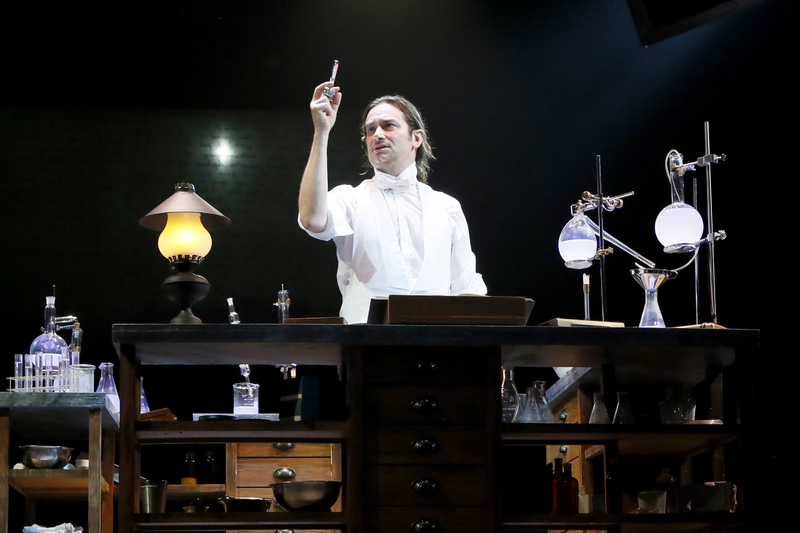 Jack Mehler’s scenic design and lighting, and Gerard Kelly’s hair and wig design – especially with Maroulis as Hyde –also stand out. The sound design at NSMT is almost always excellent, and Daryl Bornstein’s work is no exception. Milton Granger and the orchestra perform the dark, foreboding score with aplomb. “Jekyll & Hyde” is not a happy musical. But if you are looking for a dark but ultimately rewarding evening of theater and hearing some great voices sing songs designed explicitly for them, this is your moment. The North Shore Music Theatre production of “Jekyll & Hyde.” Conceived for the stage by Steve Cuden and Frank Wildhorn. Book and lyrics by Leslie Bricusse, music by Frank Wildhorn. Directed by Robert Cucciolo. Choreography by Kelli Barclay Scenic and lighting design by Jack Mehler. Sound design by Darryl Bornstein. Music direction by Milton Granger. At the North Shore Music Theatre through Oct. 7. nsmt.org.